AND THE WINNER IS . . . . AcousticSheep LLC! 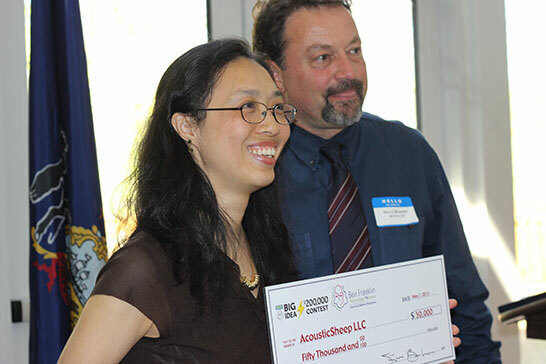 Ben Franklin Technology Partners is pleased to announce that this year’s winner of the BIG IDEA contest is Dr. Wei-Shin Lai and her team with AcousticSheep LLC. The company, which is located right off Peninsula Drive in Ebco Business Park, is developing software and phone apps, that when coupled with their latest generation of SleepPhones®, helps people get a good night’s sleep without using unreliable and expensive solutions or medication. For more information contact jennifer@acousticsheep.com or see www.sleepphones.com. “We have an idea that will transform SleepPhones from being headphones that help you sleep better to a community participating to improve sleep throughout the entire world. Winning this amazing prize will allow us to create a new technology to eliminate sleepless nights cheaply and completely drug-free for everyone,” said Dr. Wei-Shin Lai, inventor and founder of AcousticSheep LLC. Harb Nayar with TAT Technologies.